Calcium Supplements – Good or Bad for Women’s Health? Home Women's Self Care Calcium Supplements – Good or Bad for Women’s Health? As women age, they probably encounter creaky bones, poor dental health and joint pain, raising apprehensions of calcium deficiency and diseases such as osteoporosis. Maintaining good bone health can be crucial for all women; but particularly older women, and those hitting menopause, but a calcium supplement may not be the obvious solution that we would think it is. Calcium is the key to preventing bones from thinning and becoming brittle and prone to breaking. Menopausal women are often routinely prescribed calcium and vitamin D supplements to help prevent bone loss. Many women also take supplements of calcium of their volition because it was suggested by someone or because they think it is the advisable thing to do. studies have been able to demonstrate that calcium can also increase longevity of people. Though calcium supplements are routinely prescribed to maintain bone density and health; many experts question the need and even the safety of taking calcium supplements. An earlier study published in the British Health Journal had found that risk of heart attack increased by as much as 30%, due to calcium supplements, whereas the benefits, if any from the supplements were ‘modest’. 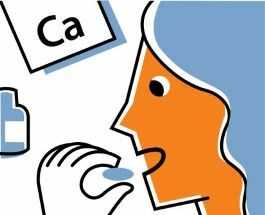 The most recent study on the subject also shows that prescribing calcium supplements may not help in preventing osteoporosis and these routine prescriptions should be reevaluated. The apprehension is raised by experts that excess calcium could harden arteries and/or cause blood clots; both of which contribute to heart disease and stroke risk. In this study however, the supplements were not found to increase or lower heart disease and stroke risk, and the researchers were of the view that more research needs to be done, in order to confirm or negate the possible impacts of calcium supplements on heart health. So what are women to conclude from this? As of now there isn’t enough evidence to stop taking calcium supplements if they have been prescribed. Perhaps women would do well to steer clear of self medication and not take calcium supplements simply because they think it’s a good idea. A medical evaluation to see if there are benefits should be what decides whether or not to have the supplement. Also get good quality supplements that will be absorbed by the body effectively. Meanwhile it is always best to have calcium from food – skim milk, low fat yoghurt, sardines in oil, oats, cottage cheese, veggies such as cabbage, turnip greens and so on. Previous articleCysts in Breast Tissue – What Causes Them and What Do They Mean?